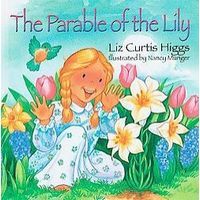 This story was written by Liz Curtis Higgs and has masterfully painted pictures by Nancy Munger. The story begins in the winter months. Maggie goes to the mailbox down the lane to retrieve the mail and receives a mystery letter. It told her that a special gift is on its way just for her. This letter aroused her curiosity and she anxiously waited for the gift. The days went by and finally the gift arrived. Her father, the Farmer watched Maggie open the gift and saw her disappointed face. The gift wasn't a doll or new toy; it was a box full of dirt with instructions that said, "Hide in a cool dark place, water as needed, When spring comes bring into the light." Maggie figured it was probably a bulb that would bloom sometime. She placed it on a shelf in the basement and pretty much forgot about it. The Farmer was sad because he had given her this gift, but as spring came he waited and hoped she would remember the box. 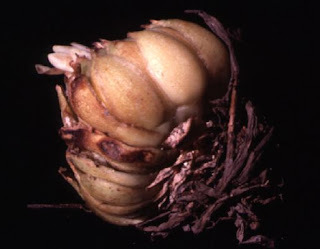 When spring came, the Farmer got out his gardening tools and began to work in his garden. Maggie ran to the basement to get her tools and accidentally knocked down the box full of dirt. Out rolled the bulb. Maggie picked it up angrily and threw it outside. She was angry with herself and still hurt from the disappointment that the box had not held a new toy. On Easter morning, Maggie woke up early and went outside to pick some flowers. In the garden, she saw the most beautiful lily plant that ever bloomed! She called everyone to get up and see the beauty that she knew had come from the ugly box of dirt. When she saw her father's face she knew he had given her the bulb. She asked him for forgiveness and he said to her, "That's what Easter's all about." Sunday Tippet ~ The box of dirt came as an undesirable gift...but, was it? Don't judge a book by it's cover. Beauty is often found inside...What you might see as a insignificant gift from someone, might be something of great value and worth to you someday. As many people in the world celebrate Easter in some way today, let's remember to appreciate those gifts that are placed right before us, but we somehow toss to the side and often forget. 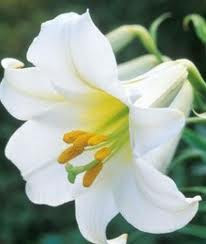 Hoping that all of you have a wonderful Easter Sunday!!! 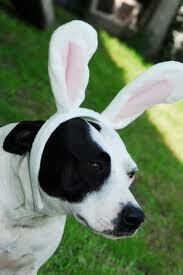 And don't let the "Easter Bunny" get away with the eggs at your Easter egg hunt! I love stories that teach us something. Happy Easter to you and your family! Thanks, Howard. We often ignore the gifts right before our eyes! Enjoy the day. Well stated, Emily, our world needs some tender loving care and less of rejection!